This coming May 18, marks the 30th year since the Gwangju pro-democracy movement. It showed the spirit of resistance and compromise that was needed to recover true democracy stained by an oppressive dictatorship. It was from that moment that the entire nation united against injustice. A history of constant endeavor to democracy in the Republic of Korea has made Korea what it is today. On the 30th anniversary of the tragedy, the footprints of the struggle gestures us to follow. During the pro-democracy movement held in Gwangju, Dongho, a middle school student, loses his friend as a result of martial law and the army’s brutal assault. He is ordered to work for the provincial government and remove corpses. Preparing the dead, victims of a political movement, for communal funerals, he suffers mercilessly from the guilt of being unable to hold a funeral service for his friend. He recalls his friend’s death and how he ran away from the march. The memory is so overwhelming that the trauma remains as real as the day it happened. Surrounded by bloody bodies, he becomes outraged at the world and even at himself. One day, he decides to no longer evade the situation and confronts the repressive regime. Dongho chooses to remain inside the provincial government building which is under siege by the army. The story then turns to Eunsook and Jinsoo and several other survivors of the pro-democracy movement. They, too, are suffering from the traumatic experience they had during the Gwangju pro-democracy movement. Each character’s trauma is shown. All participants in the pro-democracy movement suffer unending pain. Are you curious about the other characters’ experiences? This reporter recommends reading other chapters of the story and empathize with the victims and their heartbreaking stories. Are you familiar with Writer Han Kang? Have you ever heard of the Man Booker Prize? Han Kang is the first Asian writer to be awarded the Man Booker Prize for ‘The Vegetarian’ in 2016. She is also a candidate for the Man Booker Prize 2017 for the novel ‘The White Book’. The Man Booker Prize is one of the world’s top three literary awards, others being the Nobel Literary Prize and the French Goncourt Literary Prize. 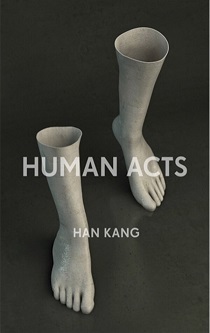 Her novel ‘Human Acts’ presents the story of the pro-democracy movement in Gwangju in May 1980. The book painfully presents the ten days’ pain from Gwangju and horror of the cruel slaughter of Korean people by their government. Some literary critics claimed ‘The novel arouses historical values so desperately needed today.’ Others say ‘The novel makes even dismissive readers reel in shock.’ This SMT reporter, suffering from melancholy, felt a chance of pace by reading a book that had dramatic characters would jolt her back from the sadness, so she chose it. The SMT reporter highly recommends to read the novel. However, for Koreans, they are reminded that history is more important than a plot itself. Especially, for Sookmyungians who are proud of Korea’s deep history and tradition, this book is essential reading. This month, how about reading a book guaranteed to cultivate historical consciousness? In January 1987, a student from Seoul National University, Park Jongchul, is tortured and killed during an interrogation about the whereabouts of the campus leader. Commissioner Park tries to conceal the case by cremating the body before an autopsy can be performed. However, Prosecutor Choi refuses to allow the procedure, and tension between Commissioner Park and Prosecutor Choi grows. The case quickly and accidentally spreads among the press. Authorities allege that Park Jongchul had died of shock, but one reporter dug deeper and uncovered the truth. The final diagnosis is “drowning as a result of water torture”. Accordingly, authorities send two detectives to counter his claim and shift the blame from them. In the meantime, Warden Han hearing the truth about the case from Detective Cho who had been jailed, askes his cousin, Yeonhee to deliver a message to Kim Jeongnam, a pro-democracy activist. Authorities do their utmost to cover up the case and President Chun formally announces he will not modify the constitution. Citizens and students outrage against the government in order to fight against the regime to call for democracy. Will the people’s struggle in the movie result in democracy? In June 1987, when people suffered under a military regime, a prolonged one-man rule, the whole nation took to the streets and shouted for democratization. Not only one claims to have headed up the revolt. Someone might be a writer, or a journalist, and still others might have been mechanic, medical personnel, or a student. Regardless, everyone at that time in that page of history had the courage to stand up and demand democracy. Knowing this, the story in 1987 written by the whole public, not one specific person. Everyone at the time was responsible for changes that occurred in the Korean government and the road towards democracy. Because of that act enterprising for noble cause, that Koreans can now be the masters of their own country. Thomas Jefferson, the 3rd President of the United States and the principal author of the Declaration of Independence, said “The tree of liberty must be refreshed from time to time with the blood of patriots and tyrants.” As the phrase summarizes, the freedom we have now was made at the hands of blood, sweat, and tears of past citizens, so they should be remembered. We should remember the day in 1987 when the center of Korea bolstered the country towards a democratic society.